This post was written jointly by Michael Lopez (@StatsByLopez) and Gregory J. Matthews (@StatsInTheWild). In last week’s post, we showed that several of the larger statistically-inclined websites which offer NFL picks have had a rough go of it to start the season, at least as far as their picks against the spread. More surprisingly, these results come on top of a string of several successful seasons in which each site consistently posted winning (>50%) results. Today, we dive in to explore why the sites may have fallen behind the 8-ball. First, we allocated picks from Football Outsiders, numberFire, Team Rankings, and Prediction Machine, four of the websites that we discussed last week. While there are several other competing analytics sites worth mentioning (including Statsational, CFBMatrix, and Massey-Peabody, who have had decent seasons), we stuck with these four because they had readily available for several seasons going back in time, and/or because they pick all NFL games each weekend. These results aren’t totally surprising; the public often backs favorites and home teams, leaving skilled betters to often choose underdogs or road teams. In fact, over at ESPN Insider, Dave Tuley touts a “dogs or pass” philosophy. Still, it’s noticeable that all four prediction sites tend to back underdogs, and most tend to favor the road team, at least through week 8. Perhaps these numbers explain the poor performance through week 8, as home teams (55% ATS) and favorites (54% ATS) have cleaned up. Next, we consider if the sites are similar with respect to their picks. The following cells indicate the percentage of picks in which the two sites (one on the row, the other on the column) have agreed on. Surprisingly, the websites appear to be using methods or algorithms which are independent of one another, with percentages around 50 indicating that whether or not each pair of sites agrees on a pick is more or less a coin flip. Better yet, what if all four sites agree? Here are the frequencies, and cover percentages, based on the number of websites which backed the home team. This suggests the sites are in complete harmony with respect to picking the road team, home picks are a healthy 12-7-2. Of course, those numbers are too small a sample to yield any statistically significant results. Let’s now take a look at all the individual teams and see how the group as a whole has done for each. The table below show the total record against the spread for all four sites broken out for games involving that team. For instance, the four sites are 15-17-0 ATS when picking games involving the Chicago Bears while their picks are 17-11-0 ATS for the games with the Atlanta Falcons. It looks like these sites are having particular trouble with the Bears, Packers, Saints, 49ers and Titans. Most of the other records for each team are at or very near .500 with very few teams having a winning record. In fact, there are only 5 teams that these four sites in total have a winning record for so far this season: Falcons (17-11), Bills (18-14), Vikings (18-10), Patriots (18-14), and the Raiders (14-10-4). Is there any obvious common thread between these teams? Please leave serious and sarcastic suggestions in the comments. Next let’s separate out each site and look at winning percentages. The graph below shows a summary of winning percentages (ATS) for each site. Each wedge represents a team and the larger the wedge the higher the winning percentage. Each group of four plots represents a site. 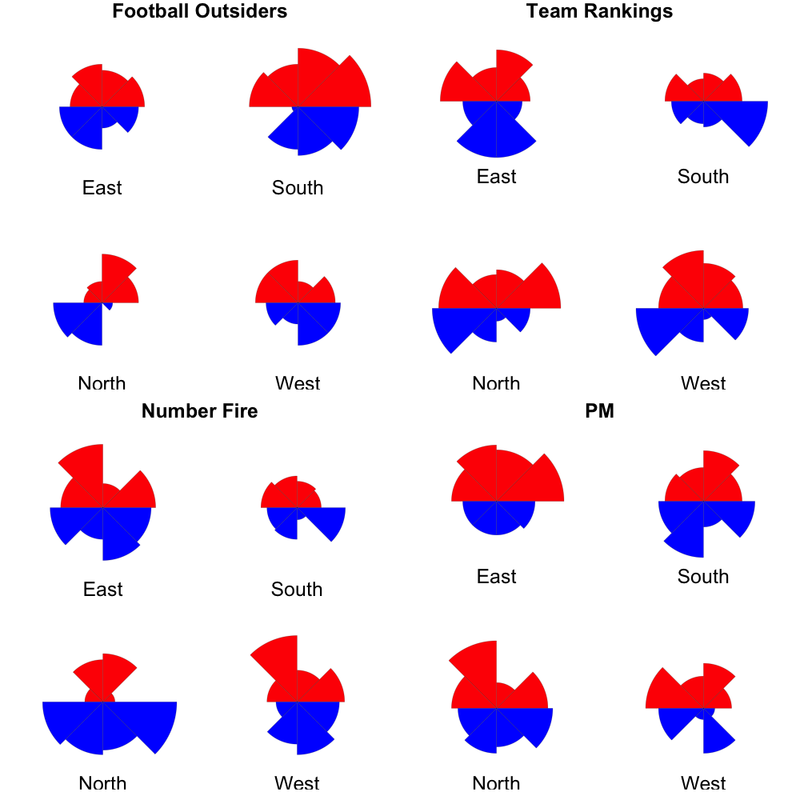 The divisions are labeled and the conferences are represented by blue and red wedges for the NFC and AFC, respectively. So, for instance, Number Fire is doing a really good job picking games against the spread involving NFC North opponents whereas there are not doing so well against the AFC North. Finally, below are the results from each site that were used to generate the above image. No site has a perfect record with any team this year, but Football Outsiders is getting killed by Chicago (0-6-1) and the Saints (0-7). Though they aren’t the only ones being scorched by the Saints. White NumberFire is 4-3 with the Saints, TeamRankings and Prediction Machine are 1-6 and 3-4 respectively. Posted on November 1, 2013, in Uncategorized. Bookmark the permalink. 1 Comment.